Goldfish Secrets is the short story prequel toThe Lady of the Vineyard. 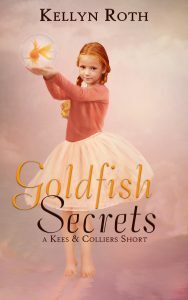 Goldfish Secrets is a standalone prequel short story to the Kees & Colliers series. Where can I buy Goldfish Secrets? You can purchase it on the following sales channels (eBook only). What age-level is Goldfish Secret written for? Although appropriate for all ages, this short story is geared towards readers 4-10. Is Goldfish Secrets a clean book?